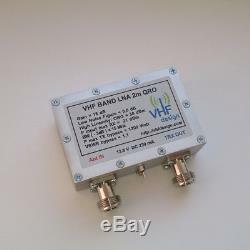 Low noise amplifier for 2m band LNA-2m-QRO. LNA 2m QRO comes in two editions: based on PGA-103+ and based on ATF-531P8. Edition that based on PGA-103+ with built-in bypass relays up to 1200 Watts is listed here. It assembled into milled aluminum case with N-female input and output connectors. Assembling with different connectors in QRO lineup is not possible. 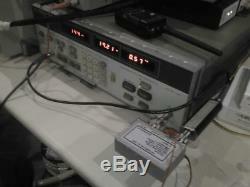 Pmax TX bypass: 1200 Watt. 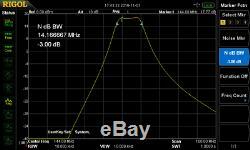 BW(-3 dB): < 15 MHz. Noise Figure: < 0.6 dB. P input: 21 dBm (max). VSWR bypass: < 1.1. DC voltage: 12 - 13.8 V. Dimensions: 86 mm x 76 mm x 26 mm (with connectors). PGA-103+ documentation in PDF available here. It is no need to worry about the "bypass" of this LNA - just simply connect the unit to the feeder. During RX (LNA DC Power = ON) unit works in "LNA mode". When switching to TX (LNA DC Power = OFF) unit works in "Bypass mode". This unit recommended to use with a sequencer in order to be sure in correct RX/TX switching. You can find our Sequencer PCB solution in listed items. Please, take a look at this small tutorial. Video tutorial - LNA connection and sequence guide. Never put RF Power on LNA Output with DC Power ON. QRO LNAs can't be powered through the feeder, only via pass-through capacitor on LNA's body. Working with antennas that have a bad VSWR (> 1.5) can lead the failure of the RF relays. Please, take a look at our other products. The item "LNA 2m QRO 144 MHz built-in bypass relays N-female" is in sale since Sunday, September 24, 2017. This item is in the category "Consumer Electronics\Radio Communication\Ham, Amateur Radio\Ham Radio Amplifiers". The seller is "vhfdesign" and is located in Kiev.